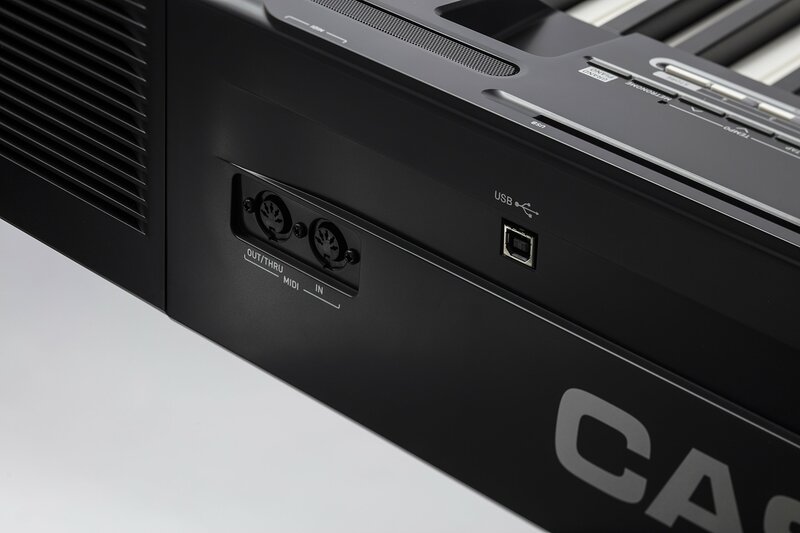 If you have experienced the Casio PX-350, you will not want to miss this new successor. Recently, Casio has launched the amazing Privia series that serve the needs for performing the tunes of the mind well. At first glance, the Color Touch screen will draw the attention of customers. As the latest edition of the excellent series, the Casio PX-360 still brings remarkable features and new advancements to the world of music. At first glance, the Color Touch screen will draw the attention of customers to investigate deeper. This piano has a lot of brand new exciting features that all fans are looking for. You may be wondering if the upgrade will be worth your investment or not. 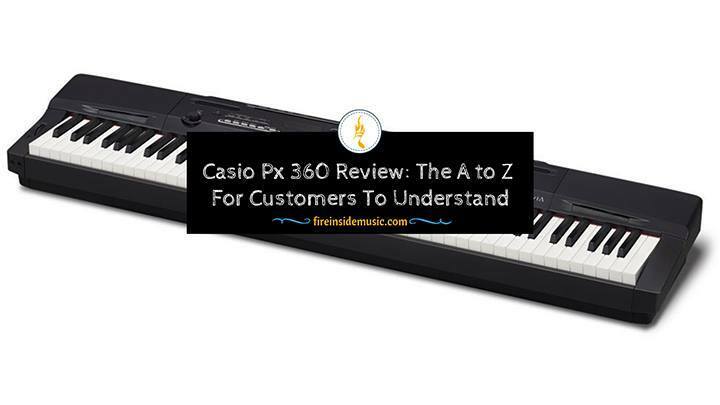 Read our Casio PX 360 review to know the reasons why you should stick to this new product instead of your current digital pianos. 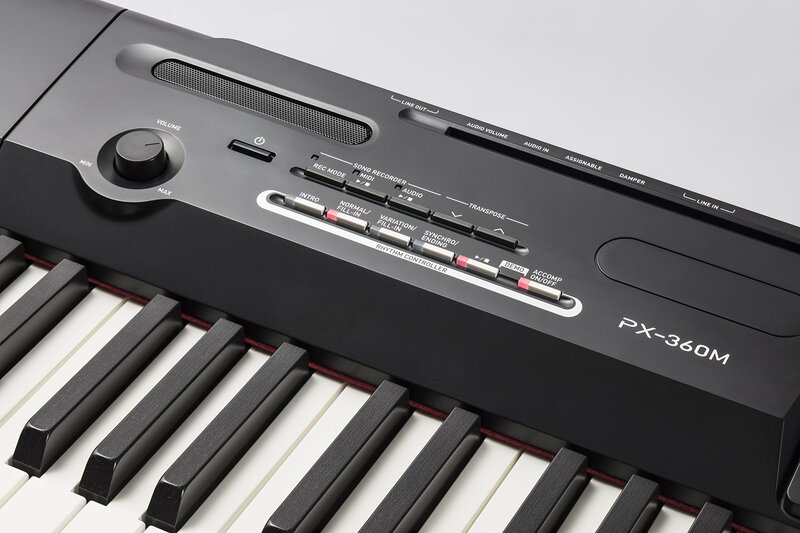 Who Should Play The Casio Px 360? This part is aimed at giving a realistic picture of the upgraded digital piano. Since the very first days of the Casio px 360’s launch, the product seems to stack up against the crowd thanks to its performance and price. The easy-to-use interface has icons tahat can be easily recognized. Below, we will introduce how well and effectively the digital piano can perform. And, you can also see its edge over previous competitors within and outside the Casio family. The Color-Touch Interface can be controlled from the 5.3-inch monitor located at the control panel’s center. The user-friendly interface has icons that can be easily recognized. Here, you can simply make changes and explore diverse features and sounds offered. The Tri-Sensor scaled hammer action keyboard helps recreate the nice touch of the amazing concert grand piano. The keyboard is highly responsive. Though the weight is equally distributed, you may feel lighter on its top and heavier in the lower part. Your experience will be unique with the special keys made of real ivory and ivory textures. Feel free to handle them through difficult passages with no finger sticking, blocking or slipping. The unique sound system is Casio’s Acoustic and Intelligent Resonator, a.k.a the AiR Sound Source. Thanks to the modern linear morphing technology, you will enjoy awesome sounds produced smoothly through dynamic transitions. No invention is created equal, and Casio px 360 is not an exception. 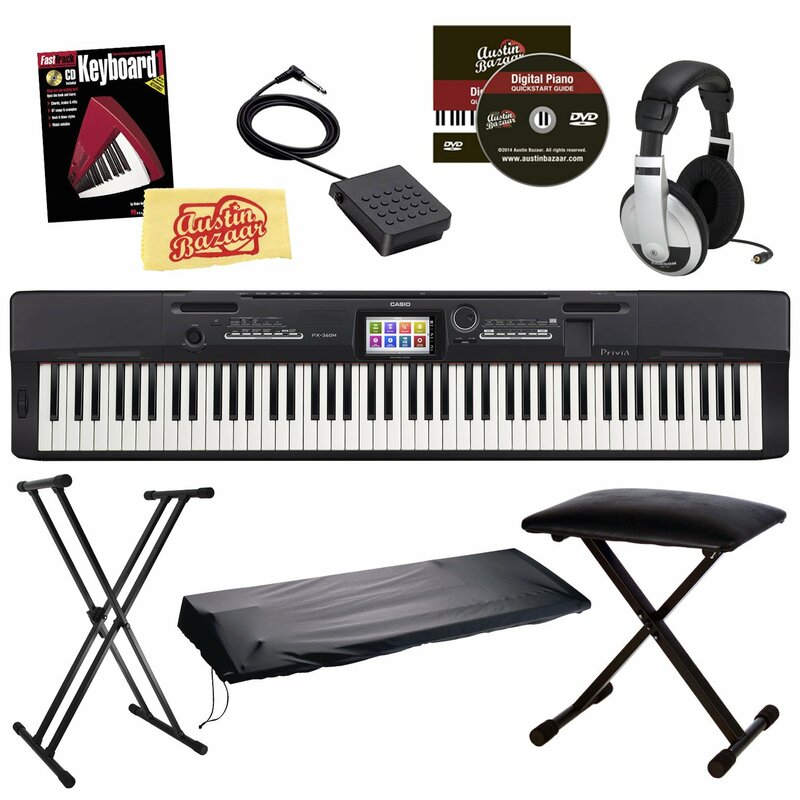 The digital piano will certainly ensure the greatest playing experience that you deserve. The great string resonance allows the fantastic notes to blend for an incredibly pleasant listening experience. And, the nice key of simulation allows your easy control of all the notes’ decay just by quickly releasing the keys. We do believe that the brilliant Casio product will be worth your time and money here. It is designed to mimic the sounds well and give users a unique feel of authentic concert grand pianos. 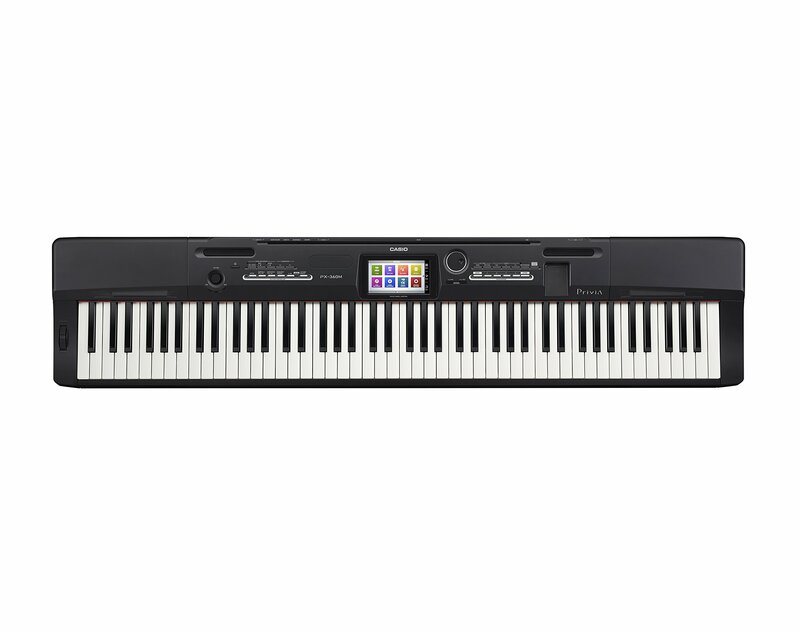 The Casio PX-360 offers users approximately 500 built-in tones and a wide array of instruments to select from. The strings and guitars are also effective and expressive. Just accompany your beautiful tones with a vast library of different rhythms for nice instruments while playing or transposing your music. The available rhythm editor offers you the chance to save approximately 10 differently customized settings. Moreover, you can select drum grooves or bass lines to play right away. The keyboard also allows you to create 50 music presets regarding tones, rhythm, effects, and even chord progressions. Well, this highly transportable keyboard weighs only 26 pounds, so it eases the process of your transportation greatly. 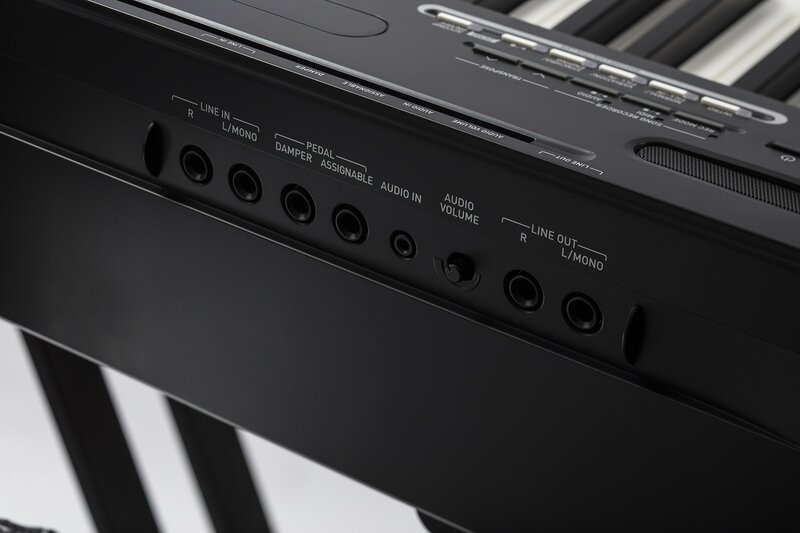 ¼-inch output sources can be connected to many MIDI I/O and amplification sources for multi-keyboard rigs. For its built-in speaker system, feel free play your favorite audios through the system. Your practices can be directly recorded to the USB stick or a 16-track MIDI recorder. Connect the USB port to your devices without any installation required. 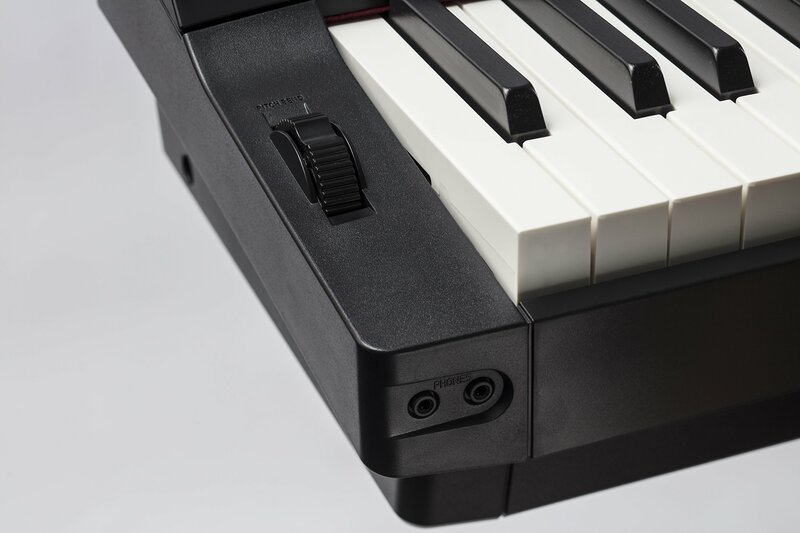 Thanks to the convenient duet mode, the keyboard can be split into 2 equal ranges. This way, beginners will easily follow the instructions from the teachers. The classroom mode makes it easy to send each piano sides to different audio outputs. Multiple different functions allow ease of use in school, concert, and home. Feature small speakers than those of others. Similar to other keyboards on today’s market, this product can serve the needs of many people at certain levels and ages. Among tons of different options to choose from, we just want to narrow down your choice and determine if it fits you or not. So, who should play this digital keyboard? Intermediate players? Beginners? Or professional players? We believe this product is a good start for beginners and intermediate players thanks to the following features. The PX-360 offers 128 polyphony, which is a fine number for entry-level players to learn. For beginners, pianos with higher polyphony are not suitable. Only professionals or advanced performers need that for difficult progressions. This keyboard is such a fertile ground for beginners to improve and intermediates to enjoy. The decent sound quality is such a step away from others in the same series. The fact is that both traditional and digital pianos often require a lot of maintenance and care. And, much like them, this Casio px 360 is also high-maintenance required. Of course, if you want to use this keyboard for a longer time, you should remember the following tips. It is a need to treat your Casio px 360 like all your beloved furniture, whether it is a traditional or a grand. Since it is damage-prone to water, heat or humidity, you should select and place the keyboard in a dry place in your house. Correct plug-ins are also a thing to consider if you don’t want to leave your new Casio px 360 right after its purchase. Many unwanted accidents have suddenly happened as a result of improper plugging or wrong electrical outlets. Therefore, you, users should observe and figure out all the proper ways of utilizing the keyboard’s plugs. No one of us wants to fall into a sudden accident while performing amazing notes with the keyboard, right? Hey, it is not a joke. We meant to say this seriously. You should remember that a digital piano is just a digital piano. Your Casio px 360 is just a common musical instrument, not furniture. Control, use it and take care of it as an instrument instead. Don’t put things on it or use it for any activity but playing sounds. What will you suppose to do when you don’t use the piano? Just leave it there? As mentioned above, this stuff is vulnerable to serious damage during your using time. That will happen the same if you don’t use it for a long time. Your instrument also requires a hygienic environment to safely stay in. Some players and musicians always underestimate the sudden damage from dust. That’s why we should protect the piano from the danger of dust. Clean the dust out of your instrument frequently. Purchasing a cover for the instrument is such a good idea. We can use it when transporting the instrument to avoid the dust gathering. The cover can be even a simple cloth to protect your piano for minutes that you are leaving it. Digital pianos are even more susceptible to certain types of dust than traditional ones. Dust can get into everything and show off its adverse effect on electronics, sensors, and sensitive components. Digital pianos also need cleaning in certain ways to avoid the damage or faults after a long time in use. The keyboard may become faulty for the simple reason that the owners did not clean them properly. Please note that it is not recommended to pick up old household cleaners to clean your instrument. The chemicals’ harshness may harm your keyboard. Check out the manual instructions or the guidelines of the manufacturer first. Things for you to prepare for your instrument cleaning include warm Water, 2 clean, soft, white cloths, and a few drops of dish-washing soap. First, mix the warm water with dishwashing drops in a tiny bowl. Make sure to mix them well. The white cloths are important when cleaning your digital piano since the keyboard may absorb harmful chemicals in colored cloths. Utilize the mixture to dampen 1 of two cloths slightly. Wipe out gently the damp cloth over keys. Don’t forget to wipe keys’ sides. Use the other cloth to remove moisture left on the keyboard. Please ensure that you will do it carefully to prevent the damage to your impressive digital piano keyboard. The water drops or moisture can be left behind as the biggest threats to the Casio px 360. For the corners you cannot reach in the keyboard, a Q-tip is necessary. Simply dip it in a small water bowl to dampen it slightly. Carefully clean and remove the dust in the corners, but don’t let any water drop in or fall between the piano’s keys. In the past, the Casio PX-5s was proudly considered the standard sound and essence of the Casio brand with multiple remarkable functions. However, until the launch of Casio px 360, Casio asserted its marks for their inventions. This keyboard serves the purposes of hobby, performance, and education effectively with its rich and smooth sounds with numerous advancements. 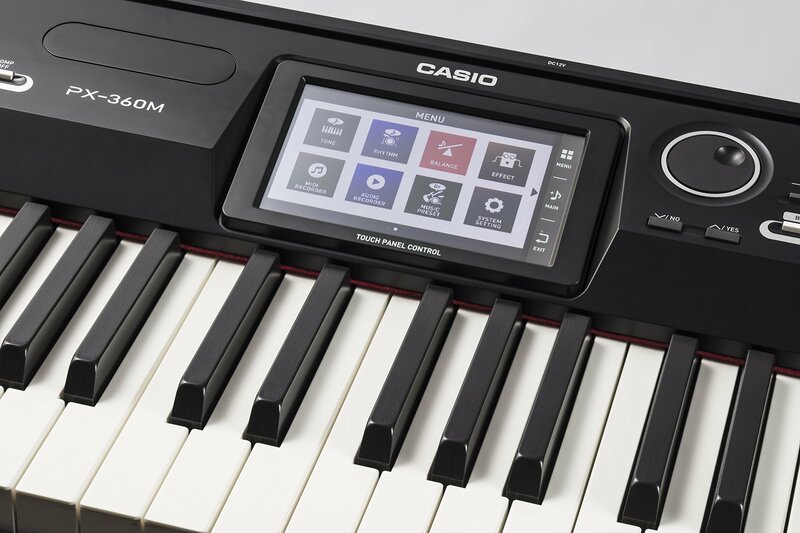 This portable piano represents Casio with a prestigious and modern design as well as convenient controls.Keep your performance convenient and pristine with full control and several functions! Thanks to the information offered, we hope that all pianists and musicians can benefit from the new technology. Shop your best purchase of the year now!